You may enable drag & drop support for this view, whith awareness of the items in the model. 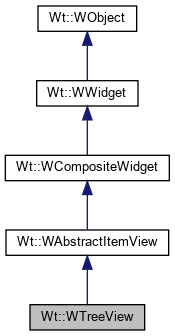 When enabling dragging (see setDragEnabled()), the current selection may be dragged, but only when all items in the selection indicate support for dragging (controlled by the ItemIsDragEnabled flag), and if the model indicates a mime-type (controlled by WAbstractItemModel::mimeType()). Likewise, by enabling support for dropping (see setDropsEnabled()), the treeview may receive a drop event on a particular item, at least if the item indicates support for drops (controlled by the ItemIsDropEnabled flag). Returns the column format string (deprecated). use itemDelegateForColumn() to customize the formatting. This method will try to cast the itemDelegateForColumn() to a WItemDelegate and return the format. Sets the column format string (deprecated). The DisplayRole data for that column is converted to a string using asString(), with the given format. use itemDelegateForColumn() to customize the formatting. This method will create a new WItemDelegate for the column, and configure its format.